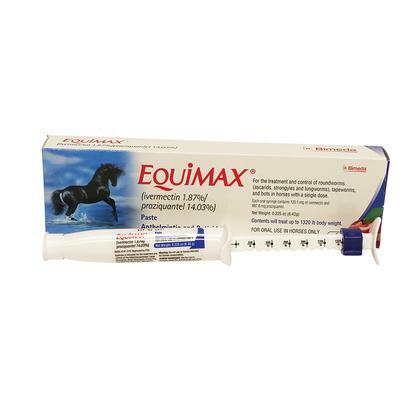 Equimax is quite different from all other horse dewormers. It contains 1.87% Ivermectin and 14.03% Praziquantel. A product that treats tapeworms and is safe for foals as young as 4 weeks old. Designed to be used against Tapeworms, Lungworms (adults and fourth-stage larvae), Large-mouth Stomach Worms (adults), Large Strongyles (adults), Small Strongyles (adults, including those resistant to some benzimidazole class compounds), Small Strongyles (fourth-stage larvae), Ascarids (adults and third- and fourth-stage larvae), Pinworms (adults and fourth-stage larvae), Hairworms (adults), Bots (oral and gastric stages), Intestinal Threadworms (adults) Summer Sores and Dermatitis caused by Neck Threadworm. Considered safe for breeding stallions, pregnant mares, and foals over 4 weeks of age.